Hello everyone, Alison here. I'm sharing a simple tutorial with you today, just to take you through how I built up the look of my coaster mini-book. We know them as beermats here in the UK, but I'm working in translation, so "coasters" it is! Really, this little book was intended to showcase the amazing Donna Downey stamps from Unity - both the hedgerow flowers and the fabulous sentiment sets. 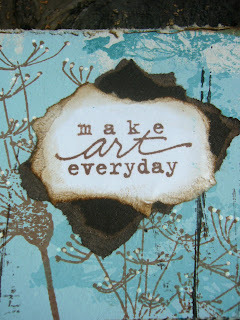 I love these stamps and find them so inspiring, as well as very versatile. 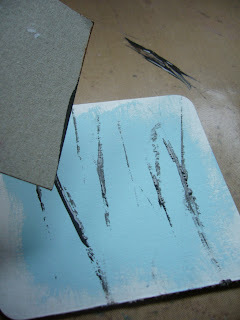 So I started with my bare coasters, and gave them a rough coat of pale blue acrylic paint. I deliberately left bare spaces at the edges for a rustic look. It also means there's variation in the textures of my "canvas". The next step was to use a piece of card to add some rough strokes and lines in another colour. I used a dark brown, and the idea was to create the look of meadow grasses, shifting in the wind. The strokes are pretty random, and I made several "cuts" in a row so that there were different amounts of paint being applied for each blade of grass. Now some stamping - yay! The first of the hedgerow stamps - these are the Wayward Blooms - done in Memento Teal Zeal. As you can see, the stamp is huge (so cool! ), so these are all partial stampings. I added some extra interest using some Tim Holtz tissue tape from the Hobgoblin set. If you tear it lengthwise, then stick it down with the two straight edges against one another, you get a nice interesting rough edge to it. Now the next stamp - Delicate Flowers - this time done in Coffee Archival. If you take a look at the finished album pages, you'll see that on opposite sides I alternated which colour each of the two flower stamps was done in. A little variation within an overall design which was intended to be as simple and serene as possible. Final step in the background layers was to use the white Inkssentials gel pen to highlight the blossoms of the Delicate Flowers. Such a calming activity - you enter a kind of trance state just dotting them on. And I think it really lifts the look of the whole page. So then it was just a matter of layering the Donna Downey quotes - stamped in Coffee Archival, and edged with Vintage Photo DI - onto some dark brown cardstock, and working out where they looked best on each page. I used sentiments from both the Empowered Words and the Art and Possibility sets, as I wanted each of them to include a "handwritten" word. And however you define "Art", I have to say making this little book really did make me happy! I hope you've enjoyed seeing some of the process. Here's where to go if you'd like to see some more close-ups or any more making-of details. Don't forget to check out the current challenge here at eP - we're looking for projects including Folded Paper of some kind. All the details are here, and we'd love to have you play along. Thanks so much for stopping by today, and see you again soon. Oh! Alison, I'm sure it is just stunning, I only have 2 small pictures coming through and I'm sure it is on my end, as I'm not getting pictures on lots of blogs tonight..will pop back later and check things out again..gorgeous colours, that much I can see..
Alison, this looks just fabulous,I love those stamps!! Such a lovely pale background that really shows off the images too. Really liked this project already the first time round! This time with the step by step I was better able to take in some of the little details. Like I totally adore what you did with the tissue tape and the grasses. 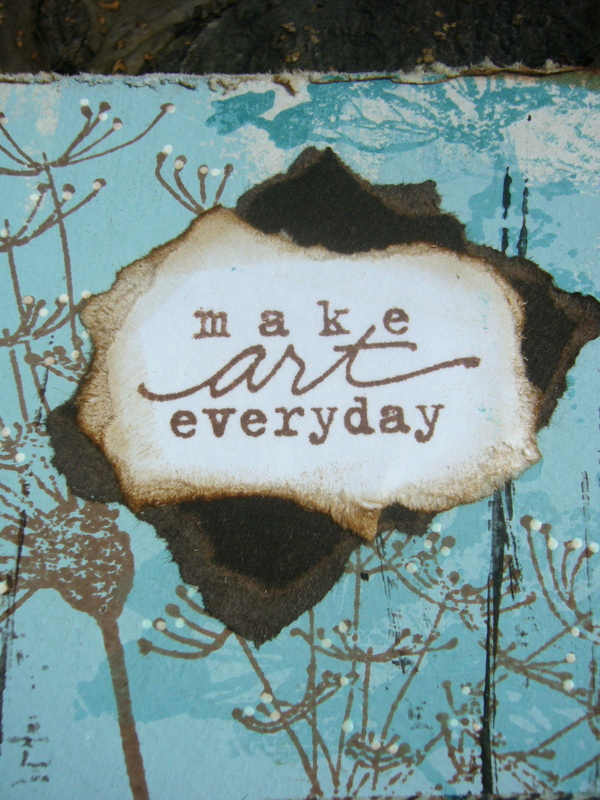 The stamps are wonderful in any case and I love how you used them! A lovely piece of artwork again, Alison! Love the stamps and how you used them! And I especially love the thick card of the beer-mats. Have to use them too sometime soon! I love it you make it look so easy ! 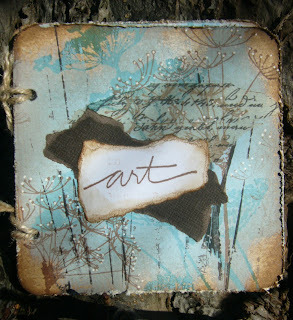 Looove it Alison..adore those stamps and how beautiful they are all together in this little coaster album....great showcase!! Love your little book! Thanks for the tip using the tissue tape. Little things like that really make a difference! Beautiful, Alison! This would be darling as a mini album too...just toss in a few black and white photos. Lovely! The stamps are perfect for this project. Wow, what a stunning piece of art. You are very talented. Thanks for the step by step. Love the gorgeous colours. This is a wonderful piece...I could look at it over and over and still find interesting details. Of course this little book makes you happy. It's made us ALL happy, it's so beautiful. Those little touches of white do the trick, for sure. Gorgeous! also love the tissue you added here and there.The pages are all wonderful and so different,even allike. That's beautiful, everything works so well together. Fabulous! Love the weedy looking stamps and you're alternating the ink colors on opposite pages! Thank you so much Alison for this wonderful step by step tut! ADORABLE LOOK of the booklet! I love it´s softness and colors ..
all is perfect to me! Serene and calm are wonderful adjectives associated with this book. It almost transports me to another place and time. The colours and layering of texture are amazing. Great tip on tearing the washi tape for an irregular edge. It looks much more organic as does the tearing around the sentiments. This makes me happy, too. Thanks, Alison.